THIS Stuffed Panda is... BIG! BIG! BIG! and SOFT! SOFT! SOFT! You HAVE to SEE THIS very, very big, beautiful, SUPER SOFT, premium quality BRAND NEW plush Panda! This is truly an AWESOME, SUPER-HUGE, STUNNING and REAL-LOOKING giant stuffed Panda. It is stuffed nice and SQUISHY SOFT, (with 100% Premium Soft Polyester), yet it still stands proud and makes a great huggable friend. You will absolutely LOVE this bear! It is quality-made with premium fabric and craftsmanship; it has a supple, soft plush body and is made with great ATTENTION TO DETAIL. Real QUALITY. The highly detailed head, and body, as well as it's awesome SIZE makes this so amazingly LOVABLE and REAL-LOOKING! Measures: 54-inches tall, (from the feet up to it's ears)font> (THAT'S a full 4 and 1/2 FEET TALL)! And it WEIGHS about 15 pounds! This will provide years of huggable squeezable love. It has a child-safe body, and will make memories that will never be forgotten! Then GET This LIFE-SIZE PANDA BEAR... NOW! 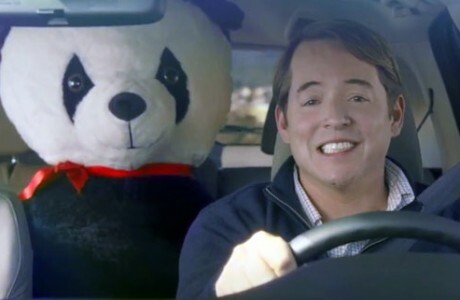 By the way, this is the SAME stuffed Panda featured in the 2012 Honda Super Bowl commercial with Matthew Broderick.